Final Cut Pro projects can eat up a lot of disk space. When a project is complete, it sure is nice to package up the files and move them to another drive. 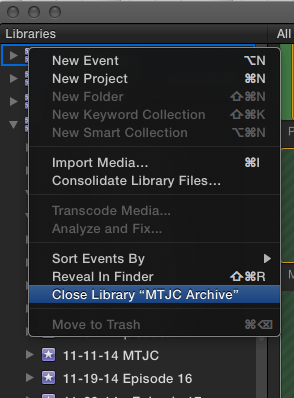 I spent a couple of hours this morning, investigating how to archive projects in Final Cut Pro 10.1.4 this morning. I found several resources that propertied to explain step by step how to go about doing this exact thing. However Apple must have changed the menu choices at some point, and the menu options and views have changed. So here is how I have figured how to combine the best of the previous methods with how the app works today. Maybe this will help you out. So here are the steps that I cam up with. Start by opening Disk Utility (inside Applications > Utilities folder). Create a new disk image. Click on New Image (or choose File > New > New Blank Image ). From Size: pulldown choose Custom. The the dialog that opens choose GB and enter a size like 5 GB. The beauty of a sparse disk image is that it does not take up that amount of space, but can grow to that size if you need it to. Press Ok to save this setting. In the Image Format: choose sparse disk image. If you are happy with the location (Where:) you can press Create. 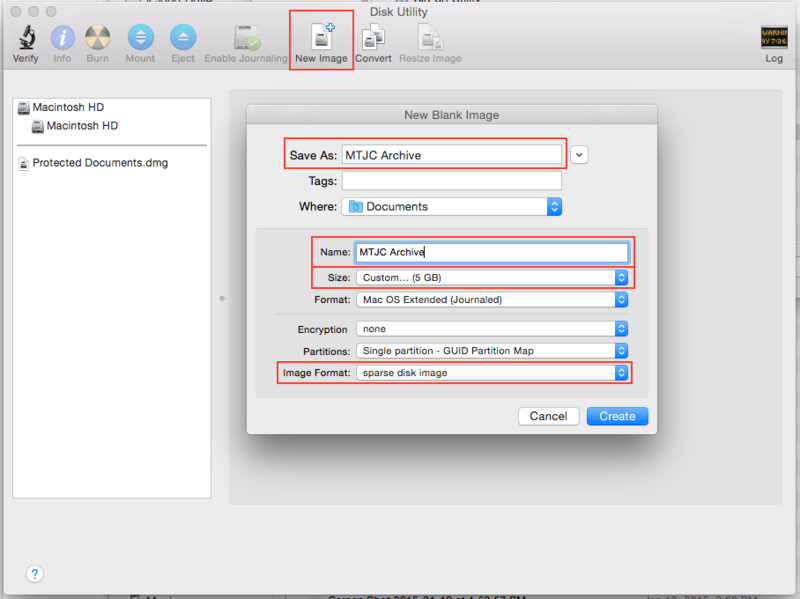 Disk Utility will create the sparse disk image and mount it on the Desktop. You can now use the disk image in Final Cut Pro X. Final Cut Pro will create the new Library with a default event (with today’s date.) You can delete that once you copy over at least one of the events you want to archive. 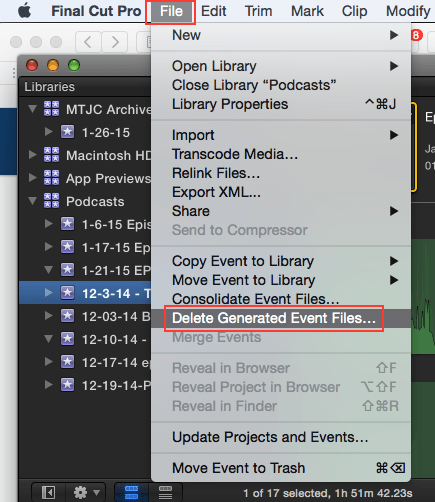 Select the Event that you want to archive and choose Delete Generated Event Files. 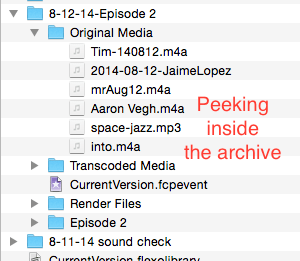 These are the files that FCP makes while you work on the projects. Check Delete Render File and choose All. You can always recreate these if you work on the project later. 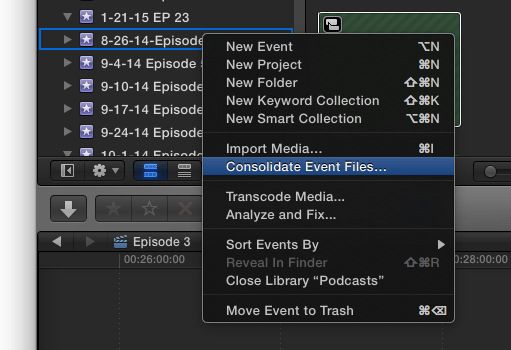 Next, with the Event selected, Control Click and choose Consolidate Event Files… from the contextual menu. 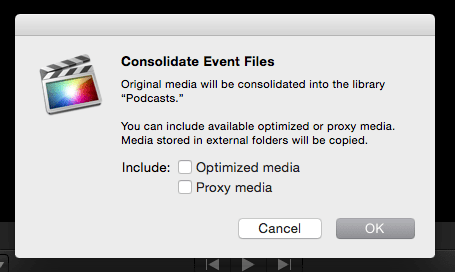 Make sure that Optimized Media and Proxy Media are not selected. You don’t need to archive these working files with the project. This step will copy all of the original source files into the project. If you are like me and you link files into your projects, you will want to consolidate and archive a copy of the originals with the event. Later you can remove the files, if a copy remains elsewhere on your disk (that’s up to you and not covered here.) After all the idea is to free up the space. You can check that the files are copied into the project, by Control Clicking and choosing Reveal in Finder. In the window that opens you can Command click on the Original Folders and reveal the path. As you can see in the image above, Final Cut Pro stores the Original Files inside an Event folder, inside a Project folder, inside your Home folder’s Movies folder. Once the files have been consolidated here, you are ready to copy this event to the sparse disk image we made above. Select the Event and Drag it onto the Library you made on the Archive sparse disk image. The cursor will change to green + to indicate that you are “copying” the Event. You will see the status indicator change to indicate the progress of copying the files. 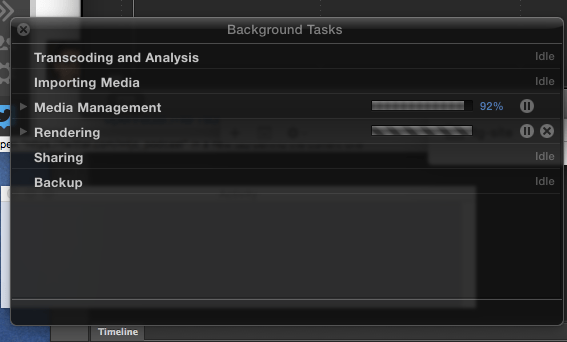 You can also open Background Tasks (Cmd 9) from the Window menu to see the progress of the copying. Pro Tip: You can examine the contents of the Archive on the disk image by Cmd Clicking and choosing Show Package Contents. Remember look, don’t touch – you are peeling inside the Final Cut Pro X project itself. Eject the disk image and then you can copy/move the sparse disk image file to another drive or server. 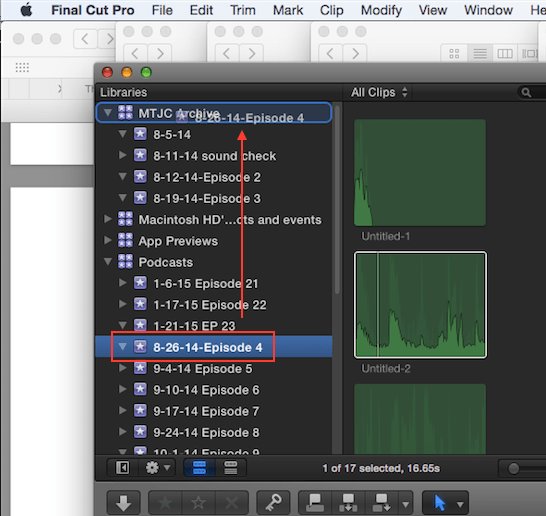 Removing the project from Final Cut Pro – with caution. Note: You accept responsibility if you remove the original project without backing up or previously archiving. If you are absolutely sure that you have safely archived the project as mentioned above. You can remove the original project by Control Clicking on the Event and choosing Move To Trash. 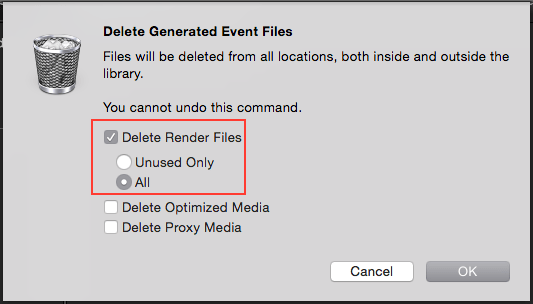 This step will remove the event and delete all of the consolidated files.